Wow, it has been really chilly here in Denver for the past few days, since Christmas actually. Christmas morning it was lovely outside, I went for a run(after we did gifts and breakfast of course), we played soccer and football out back, and then the cold winds blew in snow later in the day. Since then, it’s been snowing off and on and freezing cold. Like, in the negatives. Though it really has only been getting in the negatives over night, during the day it’s more like 2 degrees which is way better ;). When it’s that cold outside, the only thing I feel like cooking and eating are warm foods. Last night we had Enchiladas with Rice (used my stock for the liquid in the rice) and Black Beans. The night before was Black Bean Soup (used my stock in this as well). Making soups for our family of 7 requires a good amount of stock/broth, so I love that I can take my leftover carcass from the rotisserie chicken I get from Costco, through it in the crock pot over night with some roughly chopped veggies and herbs, and in the morning I have enough stock for several soups! And the house smells amazing! 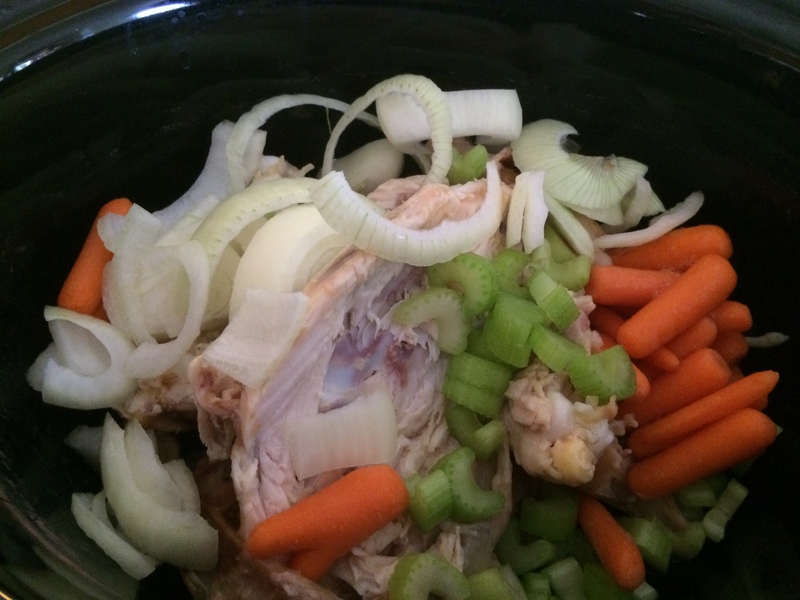 Start off by placing your leftover chicken carcass in your crock pot , including bones and skin. Add your roughly chopped onion, carrot, celery, herbs and spices. Fill the crock pot with water, leaving about a 1/2-inch of head space. 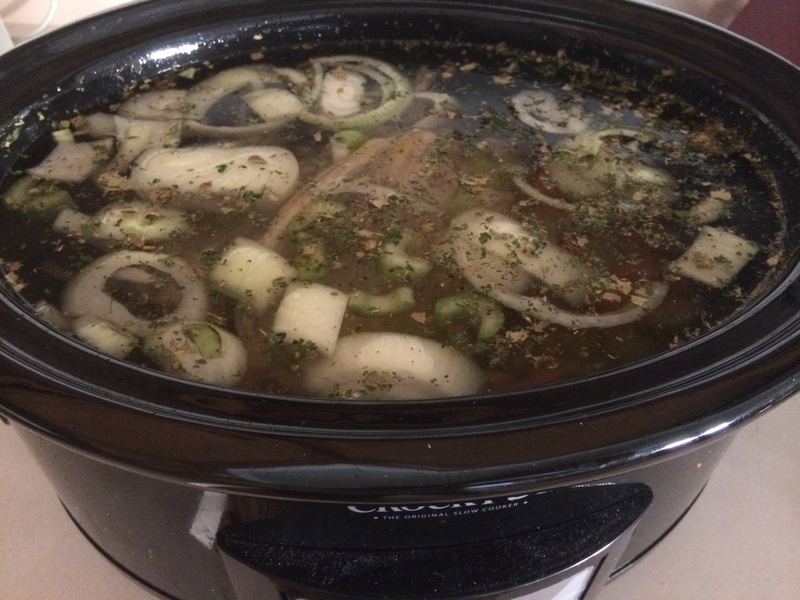 Cover and turn the crock pot on low and cook overnight, or you can start it in the morning and cook on low for 8-10 hours. When the stock is done, turn off the heat and using a ladle, pass your stock through a fine sieve to remove all of the solids. I ladle the stock into the large pyrex glass measuring dish pictured below, before pouring it into my jars because it’s less messy for me this way, but if you’re more careful than I am, you can ladle it right into your wide mouth jars while using the sieve. You can refrigerate your stock up to 2 weeks, or freeze up to 6 months. I freeze mine in Quart Freezer Ziploc bags because I’ve had too many glass jars break in my freezer which makes me a little angry; I hate wasting my precious free time… and throwing away food/broth. So I just don’t go there anymore. And actually, with a family of 7, I usually use all of it within two weeks so I generally store it all in the fridge in my jars. 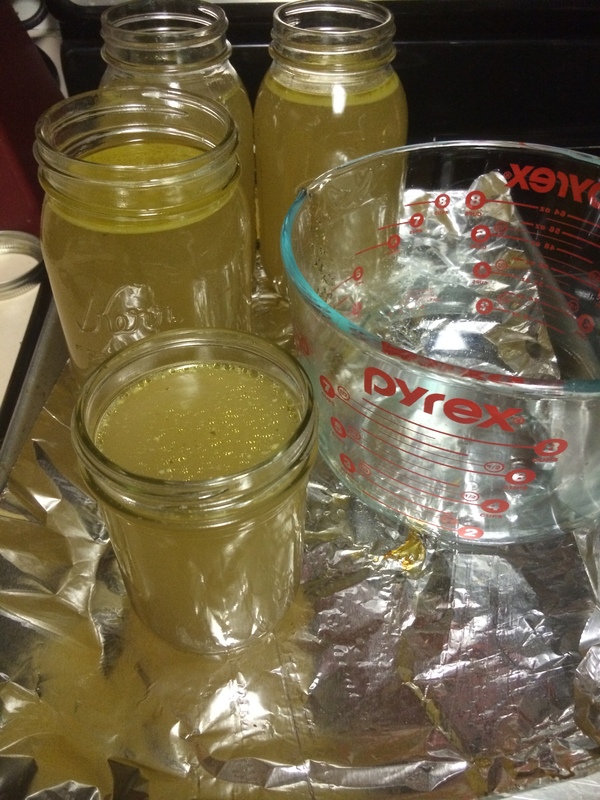 I get about 12 cups of broth/stock from this recipe. Place your leftover chicken carcass in your crock pot , including bones and skin. Add your roughly chopped onion, carrot, celery, herbs and spices. Fill the crock pot with water, leaving about a 1/2-inch of head space. Cover and turn the crock pot on low and cook overnight, or you can start it in the morning and cook on low for 8-10 hours. 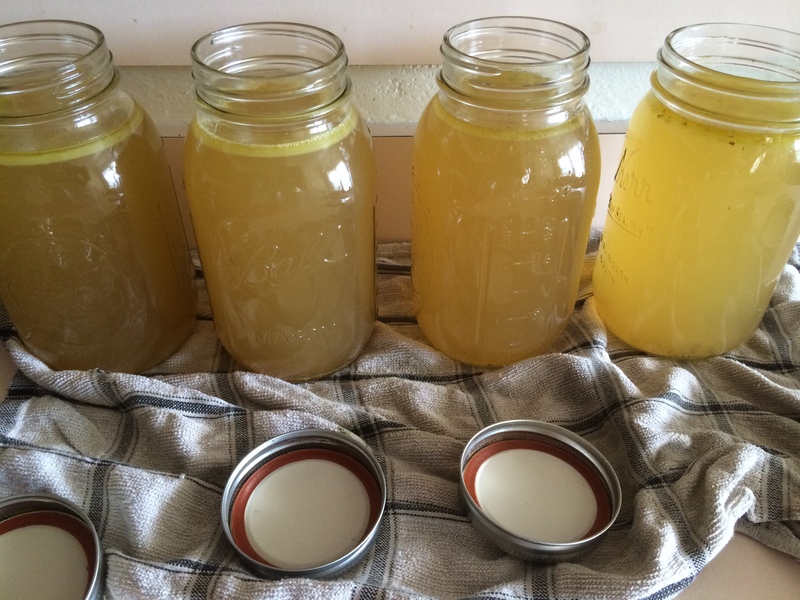 When the stock is done, turn off the heat and using a ladle, pass your stock through a fine sieve to remove all of the solids.You can refrigerate your stock up to 2 weeks(I store in Mason jars), or freeze up to 6 months(I freeze in Quart Ziploc bags). I get about 12 cups of broth/stock from this recipe. Since this week is Christmas, I decided to gather up some old favorites from this blog that would make great Christmas Eve and Christmas Day foods. We have a lot of ancestors from Italy and Mexico and so we like to serve traditional foods from those countries for Christmas Eve and Christmas day dinner which opens up conversations about our heritage and family traditions and stories. This year we’re making tamales for Christmas Day dinner which I’m excited about because although it’s been years since I’ve made them, I remember making them with my mom, aunt and sisters on Christmas. I don’t have that recipe posted here yet, but I should have it available soon. Another traditional Mexican food that we make often and love are these enchiladas. This is my dad’s recipe, who was born and raised in Mexico and who owned his own Mexican restaurant in Seattle for awhile. The sauce is made from scratch and is simpler than you’d think. This would be a wonderful Christmas dinner. Homemade whole wheat pizza is a family favorite and since we have Italian in our heritage as well, this is another Christmas favorite. This year we’re going to use this same pizza dough recipe and make stromboli for Christmas Eve dinner. Cinnamon rolls Christmas morning are a family tradition. I love this recipe and I make them ahead, the day before, so that I can enjoy Christmas morning with my family. Quiche would be another good breakfast food to have Christmas morning. You could make the pie dough crust the day before, scramble up your eggs and keep them in a container, along with any other ingredients you want to add to the quiche (grated cheese, cubed ham, chopped spinach, broccoli etc), and then Christmas morning, dump everything together and bake while you open gifts. You can find my Quiche recipe here with a yummy whole wheat crust. and this holiday quinoa salad would be great with a variety of dinners. A pretty, and tasty, green side of Asparagus with Parmesan. These candied pecans are a great sweet snack that are sweetened with pure maple syrup. This peanut butter popcorn sweetened with brown rice syrup and coconut sugar is divine! We love these peanut butter cups. They are a nice treat to have on hand(can make ahead too!) that won’t make you feel too guilty for eating since they’re made with real food ingredients. These almond blonde brownies are not only delicious, but they’re good for you too! Ground flax, whole wheat flour, almond butter to name a few, and they are sweetened with raw honey. And you could finish off with these glazed maple pecan cookies! So yum! Christmas is in a week! We are so excited! My kids are especially looking forward to eating our traditional whole grain cinnamon rolls Christmas morning; and so am I! Even though they’re whole grain, only made with whole wheat and spelt flour, no white, they are not healthy. I mean, look at that cream cheese frosting oozing down the side. Heavenly! I can’t wait! And I LOVE that I can make them ahead, the day before, and stick them in the fridge, both dough and frosting. Then Christmas morning, I pull them out of the fridge, set the dough rolls on my oven and turn it on to preheat, we start with our stockings and move onto our gifts and before we’re done, we have fresh, warm, made-from-scratch cinnamon rolls waiting to be eaten! I haven’t decided on the menu for Christmas Eve yet, but it’ll probably either be Mexican or Italian. Both of those cultures are a huge part of our heritage an we LOVE the food so they usually win over. We may even serve this Alfredo Sauce over a pasta since it’s a favorite. This is one of my go-to recipes. 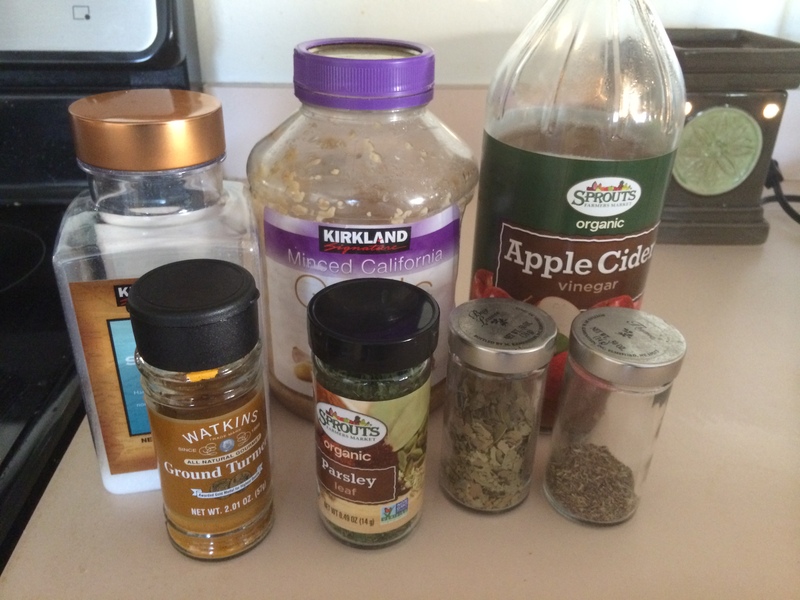 We always have the ingredients on hand and we make it almost weekly because all my kids love it. We serve it with a variety of pasta shapes, and I use either all whole wheat pasta, or half wheat, half white. I make this sauce while I’m waiting for my water to come to a boil, before adding in my pasta. Many times I’ll add a bag of frozen peas to my boiling pasta. Peas are especially nice when used with the small or medium shelled pasta shape because the peas hide inside of the shells and the kids don’t notice them as much :). We also like to add cooked, shredded chicken sometimes(Costco sells a great rotisserie chicken; we also like to boil frozen chicken and shred it with two forks), and we’ll usually serve this pasta with salad and garlic bread sticks or some other type of bread. Melt butter in a medium saucepan over medium heat. Add cream cheese and stir until it melts down. Add parmesan cheese, milk, garlic, salt and pepper and bring to a boil. Turn the heat down and simmer for 10-15 minutes until thickened, stirring with whisk occasionally. Pour over cooked pasta and serve immediately (can cover with foil and serve within 15 minutes). Years ago, when I was a student at BYU, I shared an apartment with five amazing women, seriously, I couldn’t have hand-picked better roommates and none of us knew each other going into it, most of us were from different states. I don’t believe in coincidences but I do believe in a loving and caring Heavenly Father. It was living in the apartments with these wonderful ladies, that I got more experience cooking. We each had a night a week where we were in charge of dinner; one of the best ways to learn is just to jump right in and that’s what I did. My brother, who is two years older than me, lived in the same apartment complex with 5 guys, and he, being a smart young man, joined our cooking group by partnering up with me :). Smart because it meant he got home cooked food 6 nights a week and because he was surrounded by lovely women each night :). Fred, that’s my brother, doesn’t really cook a whole lot so he mostly just paid for half the ingredients, which was very helpful since we’re all poor college students, and I would cook. He helped a little, but mostly he used that time in our apartment each evening to visit with my cute roomies :). Because we lived and ate together for quite some time, we became familiar with each others family recipes. 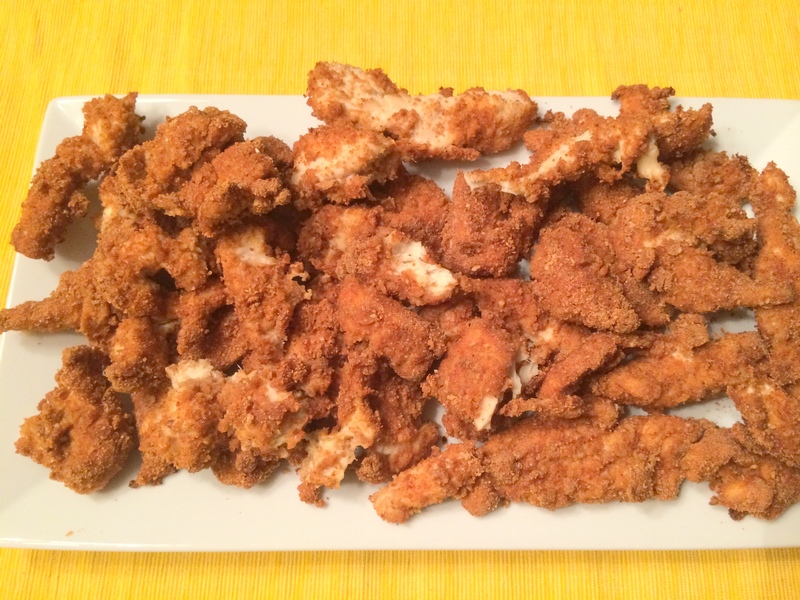 Homemade chicken fingers were one of those recipes, though I’ve changed the recipe over the years, making it faster and easier and a little more healthy. Start out by cutting your defrosted chicken into strips. If I remember to pull my frozen chicken out of the freezer in the morning, then we’re all set to slice it up, if not, just stick your frozen chicken in the microwave and hit the defrost button for about 1 lb of chicken(unless you’re doubling this recipe, then of course, do more). 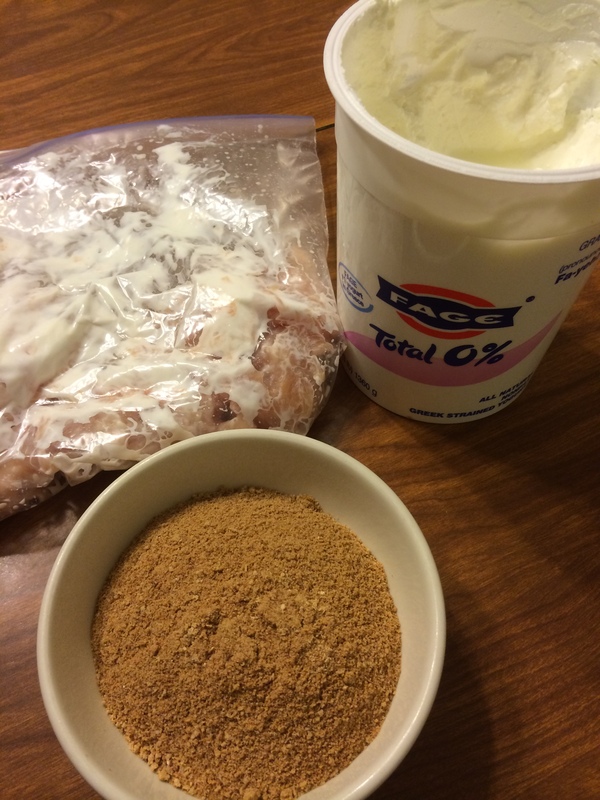 Next I put the chicken in a gallon ziploc bag, add in my yogurt, rub it all over the chicken, dump the whole wheat crumbs inside and shake and massage until the chicken is pretty evenly covered. 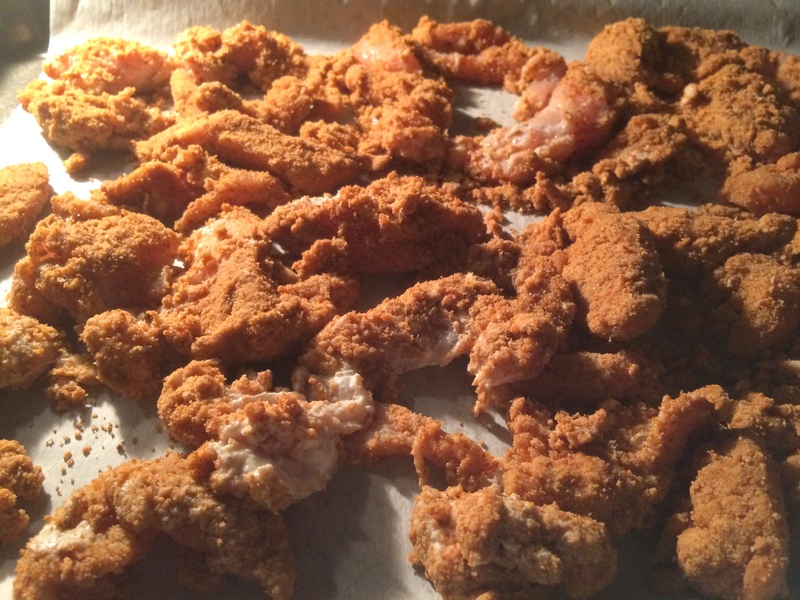 Place crumb coated chicken on a baking sheet (lined with parchment for a quicker clean up) and bake at 425 degrees for about 15 minutes, until chicken is no longer pink. We like to eat ours over rice, potatoes, salad, or just plain with a little ketchup and a side of sweet potato fries :). Preheat oven to 425 degrees. Place chicken in gallon ziploc bag. Add yogurt, seal and squeeze to blend. Add bread crumbs, seal and squeeze bag to coat chicken. Bake 15 minutes until chicken, when cut in middle, is white and done. About two or three years ago, Scott and I tried Indian food for the first time, I think ever. He had a coworker that was from India and gave us restaurant and menu recommendations. We fell in love with Indian food immediately! We’ve recreated a couple of our favorite dishes which we make fairly regularly. Our kids are learning to like it too, some more than others. A couple of them love it, but that’s how a lot of meals are; pleasing seven people, five of which are children, is not an easy thing to do. 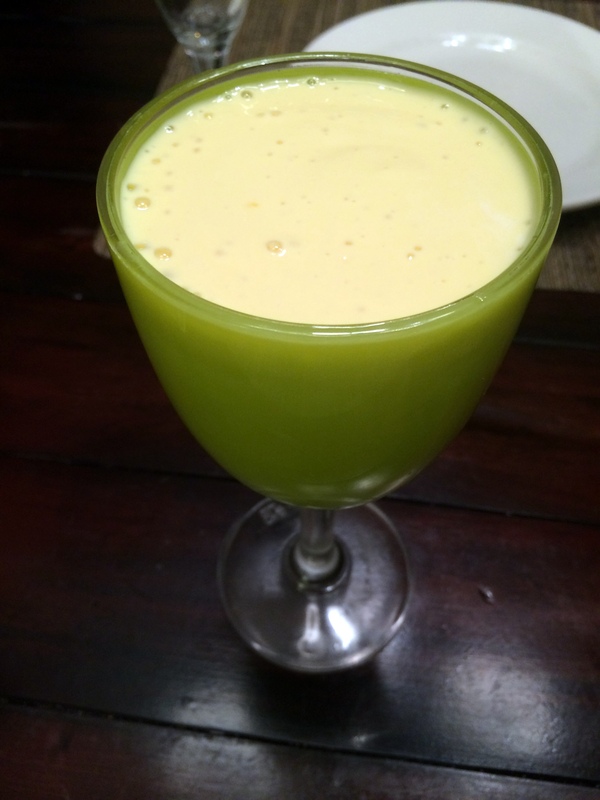 Many times we’ll serve the dish with Mango Lassi, an Indian smoothie that our children love! It’s a milk and yogurt based smoothie; so this smoothie also helps turn down the heat if you’ve made a dish that’s a bit spicy :). Not that I’ve ever done that. We make this smoothie when we get Indian take-out as well, about every other month, because sometimes, even though you ask for medium heat, the chef goes overboard and you get something pretty hot, but this smoothie will save the day because it’s milk based and that really helps cool things down. All you need for this recipe is milk, any kind, though I like unsweetened almond, plain greek yogurt(I love the Fage brand; it’s so thick and creamy), frozen mangos, or fresh with a cup of ice, and a little honey and vanilla. Put your milk and yogurt in your blender, add everything else and blend until smooth. It’ll be a bit frothy and oh so yummy! I took the picture below during one of our in-home date nights when we got Indian; we do a lot of in-home date nights since we don’t have a child quite old enough to babysit and babysitters around here are busy! Scott’s eating Butter Chicken and I’m eating Paneer Tikka Masala, with our Mango Lassi we blended up. We could have bought it from the restaurant, and we have before, but I’m pretty sure they sweeten theirs with sugar, and it’s expensive, and this is not and we always have the ingredients on hand so it’s fast and easy. Enjoy! Combine in blender and blend until smooth. Will be a little frothy. Serve immediately. Serves 2-3.